Justice League – Justice Vol. 1, 2, and 3. 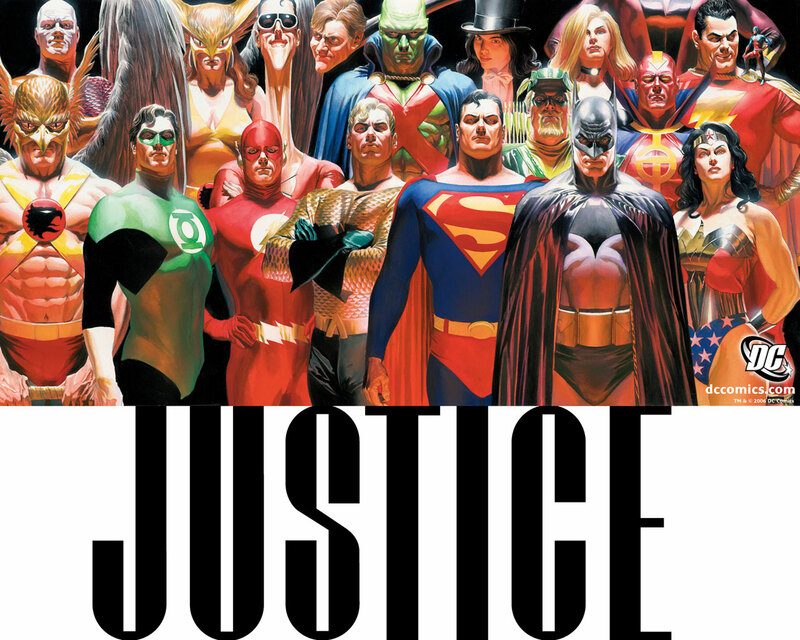 You can tell that when Alex Ross and Jim Krueger put out their ambitious Justice project, their goal was to produce the greatest non-Silver Age Silver Age DC story of all time. However, that honor goes to Darwyn Cooke’s New Frontier, and although I hate to be flippant about a book that looks as good as Justice does, I really can’t help but put it in the “just ok” pile. It does have an interesting concept going for it: DC’s supervillains get visions of their heroic counterparts destroying the planet, and team up to stop them. Alex Ross’ art is as gorgeous as always, and seeing him apply his love of the DCU to the Silver-Age versions of these characters is a lot of fun. But while the story has potential, the plot is overly complicated with FAR too many characters to keep track of, and it quickly gets bogged down by it’s own cleverness. It doesn’t take long for it to become a fairly straight forward simple punch ‘em up. The whole thing is entertaining however, and the only real awful moment of the series comes when Alex Ross decided to pick up a call from DC’s toy department, which resulted in all of his heroes wearing suits of armour for some godforsaken reason. Team-ups between the JLA and JSA have become fairly common over the years, to the extent that DC has made it canon that the teams spend Thanksgiving dinner with each other every year. Now, you may argue that someone who spends 364 days a year dressing up like a loon and fighting crazy people might want to spend the holidays with their actual families, rather than the same fetishists they spend the rest of the year with. You’d be mistaken however, and since the idea has produced some entertaining stories, who am I to judge? 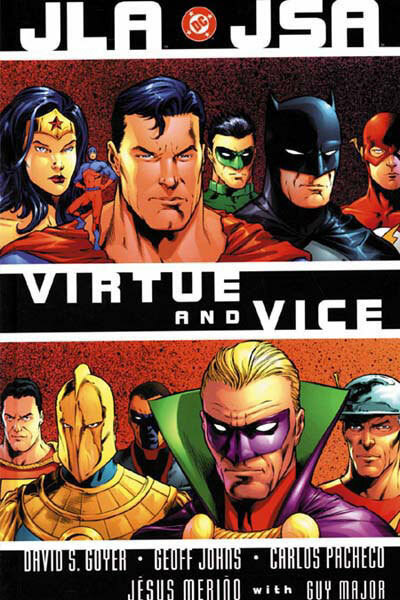 Virtue & Vice is a pretty standard team-up book, but it’s a VERY well-crafted standard team-up book. Though it would never go on my list as one of DC’s truly influential or important graphic novels, it’s definitely one of the stronger JLA/JSA stories in the canon, and Carlos Pacheco’s penciling never looked better. There have been numerous cross-overs between DC and Marvel over the years, and for the most part they’ve been about as readable as a Tea Party manifesto. This four-part epic featuring comicdom’s two greatest supergroups teaming up for the first time ever, is one of the few exceptions. Quite simply, Kurt Busiek and George Perez put together the greatest cross-over story most fans could possibly hope for. Note that I said “most” fans. The problem with a story like this is that you will NEVER please everybody, and as thanks for your efforts will probably end up pleasing no one. So although there are scenes here that caused “controversy” (“Superman is stronger than Thor.” “Is not.” “Is too.” “MOM!!! !”) at the time, Busiek’s emphasis on characterization ended up making this a home-run for me. That’s not to say it’s without it’s faults. To say that’s it’s overly complicated and dense would be an understatement. Keep in mind, some pages feature dozens, if not hundreds of characters, with the characters often changing costumes multiple times in a single page. This book is NOT for the superhero rookie, and even I had a hard time keeping track of what any of the characters were trying to accomplish. Usually that would be a turn-off, but in this case it simply served the grandiose nature of the story that Busiek was trying to tell. George Perez is one of the most critically acclaimed artists in the comic industry, and while I’m not really sure what motivated him to produce what ended up being the best work he had done in 20 years, I’m glad that he did. Although Perez has done some fine work since this came out, I think this will end up being being a fine epilogue to an amazing career. Next up: The Justice Society! This entry was posted in Comic Books and tagged Alex Ross, George Perez, JLA, JSA, Justice League, Kurt Busiek. Bookmark the permalink. 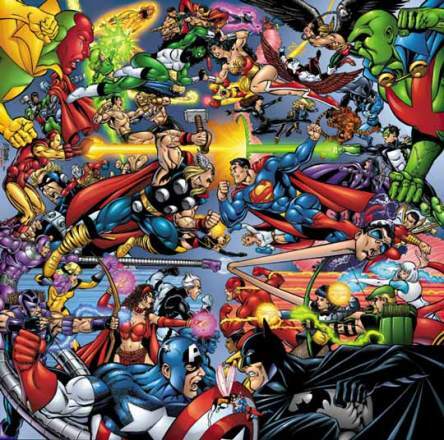 The Great Comic Book Cull Of 2010/2011 Part 17: DC Comics – The Last of The Justice League!